Since we started our little project we've seen quite a few impressive pizzas - An Extraordinary League of Pizzas if you will. Some were pretty old school like the Margherita Pizza, some were a little schamncy like the White Pizza and others were just about as American as a pizza gets like the Meat Lovers and Stuffed Crust Pizzas. But recipes like Pizza Dip are just pure Betty gold. 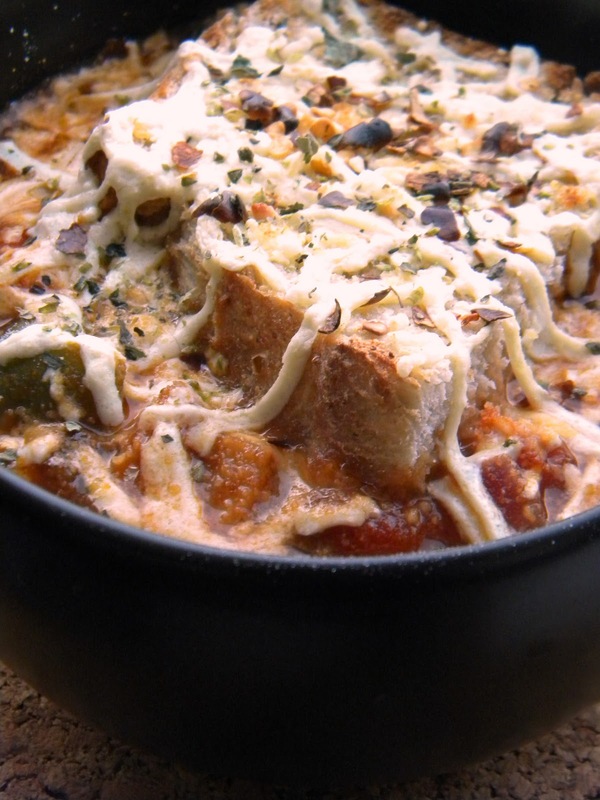 When I first saw Pizza Soup - I admit we wrote it off as one of the recipes we were dreading. We were biased and unfair. We never even read the recipe and there we were making jokes about how bowls of melted cheese shouldn't really be called "soup"... that being said I would eat bowls of our vegan Mac & Cheez sauce if I could - so I shouldn't talk. Also - this soup isn't anything like what we thought. The truth is this soup is actually a really flavorful and unique vegetable soup with some melted Daiya and toast on top. It's delicious. It's really pretty and colorful with the bell peppers, mushrooms and basil. I mean let's face it - it's kinda impressive looking. I'd bet this silly named soup would get some "ohs and ahs" at any dinner party. I just might test this theory. 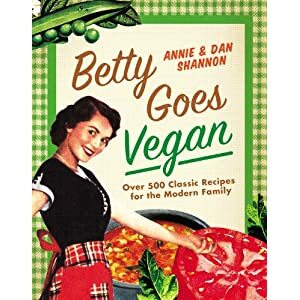 We knew going into this - we'd love Pizza Burgers but it's good to know Betty's streak is still strong. We loved Pizza Soup and I don't care who knows! In a soup pot or Dutch oven, heat Olive Oil at a medium heat. Once the Oil is warm, toss in the Red Onion, Bell Peppers and Garlic. Stir occasionally, until the Red Onion is tender. Then stir in the Ale, Vegan Beef Broth, Tomatoes and Braggs until it is blended. Then stir in the remaining ingredients except Toast, Daiya and Toppings. Heat to a boil. Then reduce heat to low, cover and let simmer for around 10 minutes. Stir occasionally. Pour your soup into a oven safe bowls. Sprinkle a little Daiya over the Soup, then place a slice of Toast and then more Daiya. I would recommend putting more Daiya on top of the Toast. Then sprinkle some Vegan Parmesan. Broil the Soups for around 30 seconds to a minute and half. I would recommend checking on them every 30 seconds and removing them once the Daiya melts and the Vegan Parmesan begins to brown. Our bowls were tall so it didn't take long because they were close to the flames but if your bowls are lower they will take longer. Sprinkle some Red Pepper Flakes and Dried Oregano over the top like they're a pizza and serve. I know some of you love some Ranch dressing with your pizza. If you go that way - here's a recipe for Vegan Ranch but you're on your own. So good... i would totally try this recipe! We featured this recipe on our facebook page, it looks amazing! Keep up the great work. Hope you have a very Happy New Year, can't wait to see what creations you have in store for 2011!! Thanks so much for the support and for making such a great product! You folks make so many of The Betty Crocker Project recipes possible. We look forward to using bags and bags of of Daiya in the new year!